Asphalt Green and the Sadie Nash Leadership Project joined forces to lead a workshop for girls who participate in our free basketball and soccer community sports leagues. The program focused on leadership, teamwork, and personal growth through sports. 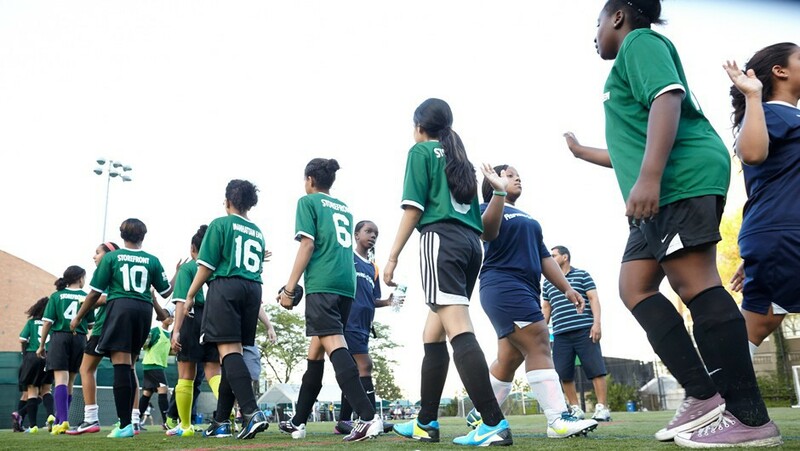 Girls ages 11 to 14 participated, and the goal was for the athletes to leave feeling a unique bond, pride, and accountability toward their teams. The workshop was split into two sessions. The first session focused on ice breakers to help the girls feel safe and comfortable speaking up. Then, they moved on to activities that brought out leadership qualities, highlighting different styles. The girls gained understanding of their strengths and weaknesses as well as their teammates’ through role play in problem-solving situations. The response to the program from the girls was overwhelmingly positive. The majority of the young athletes reported feeling a sense of sisterhood and community. Their feedback indicated that they particularly enjoyed the activities, the positive and fun environment, and the depth of communication that they experienced. We look forward to continuing our partnership with the Sadie Nash Leadership Project and bringing more team-building programs to our community sports league athletes. To support our mission, please consider making a donation here.